This article uses material from the “Ferrari F50” article on the Hot Wheels wiki at Fandom and is licensed under the Creative Commons Attribution-Share Alike License. 1999 Hot Wheels ’40 Ford Collector Number 1029 is part of the Hot Wheels Collector Number Series and is also a member of my personal collection. This article uses material from the “40 Ford” article on the Hot Wheels wiki at Fandom and is licensed under the Creative Commons Attribution-Share Alike License. 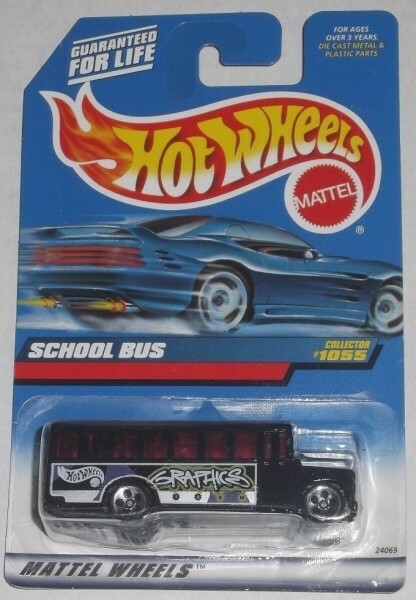 1999 Hot Wheels School Bus Collector Number 1055, originally released in 1999, is part of the Hot Wheels Collector Number Series and is also a member of my personal collection. This article uses material from the “School Bus” article on the Hot Wheels wiki at Fandom and is licensed under the Creative Commons Attribution-Share Alike License.